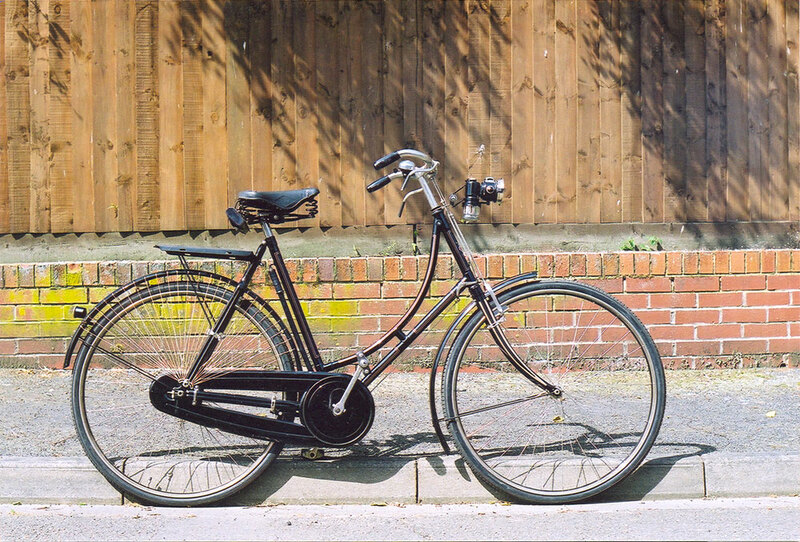 Single speed, 23" frame, 28" wheels, Crabbe brakes. 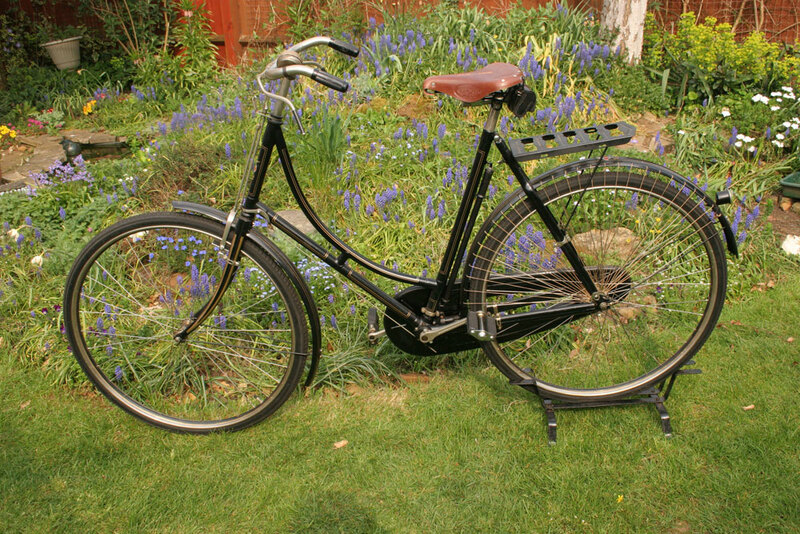 This Ariel was purchased at the Beaulieu Autojumble. 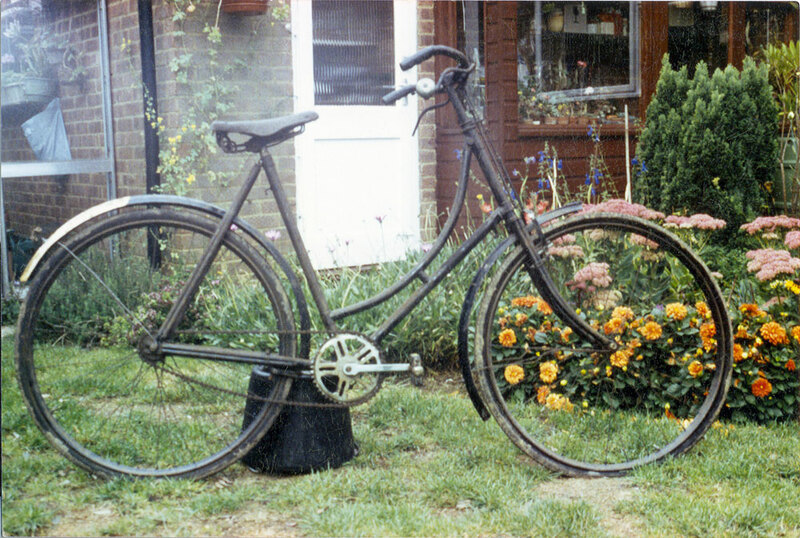 It was in a poor state and fitted with the wrong chainwheel, cranks, mudguards and seat. Some more appropriate looking parts were found and restoration was soon under way. Then disaster happened - the platers lost the original Ariel hubs. They would replace them for me, but I needed to get dimensions. Then began a search. Ariel cycles are not that common. I found several with the correct front hub, but none with a single speed rear hub. Eventually I bought the 1925 gents Ariel and was finally able to make drawings so the platers could get the hubs made for me. 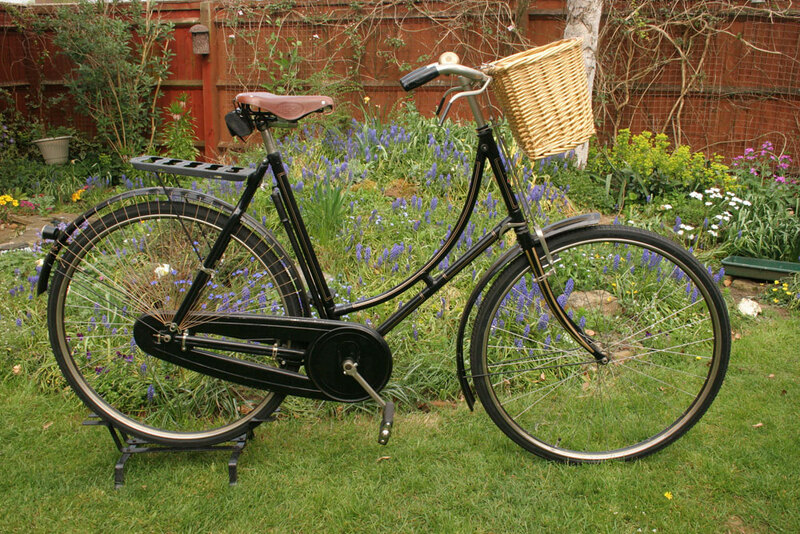 The restored cycle has been fitted with replacement mudguards and a more modern oil-bath chaincase. The original case would probably have been leatherette stretched over an aluminium framework. 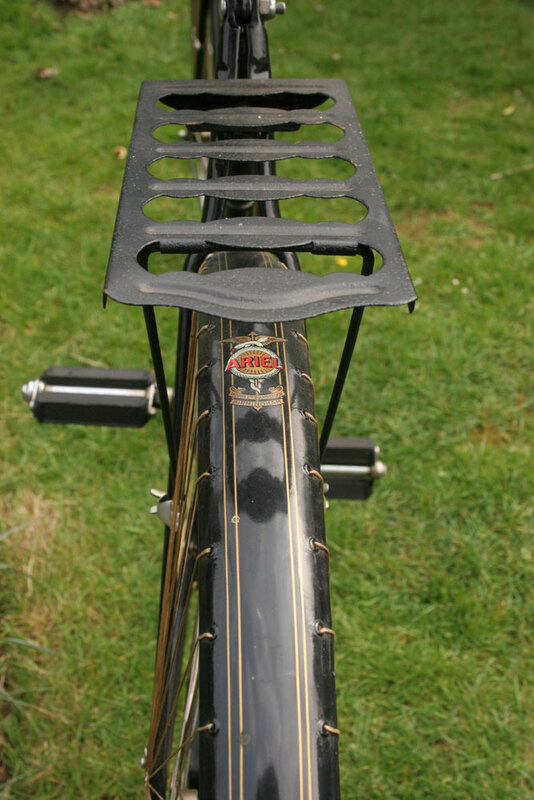 However, an oilbath chaincase was an option. The brake fittings are mostly original Crabbe items, with the exception of the front stirrup. 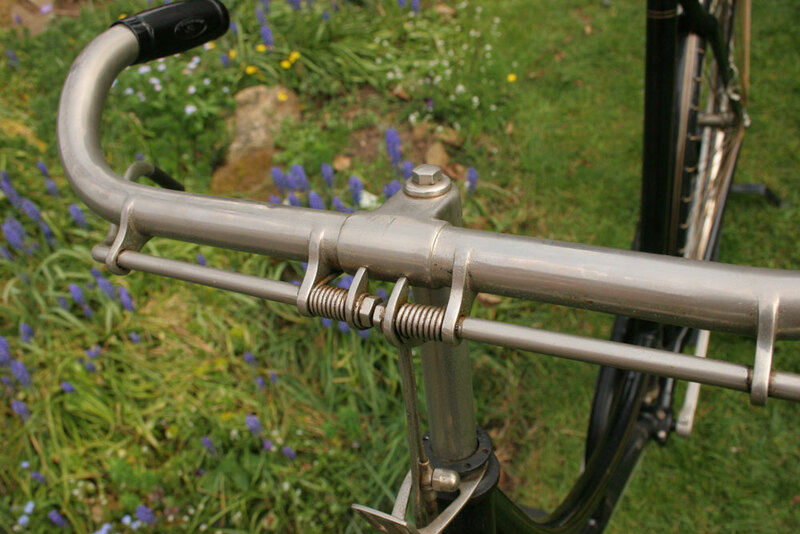 The brackets for the brake levers are brazed on. 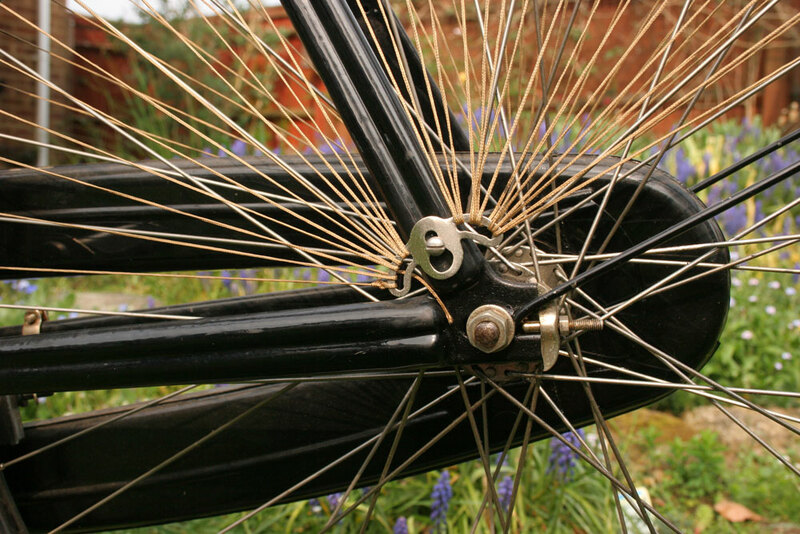 This was common on many Ariel cycles, although some of the cheaper models used screw-in lugs. 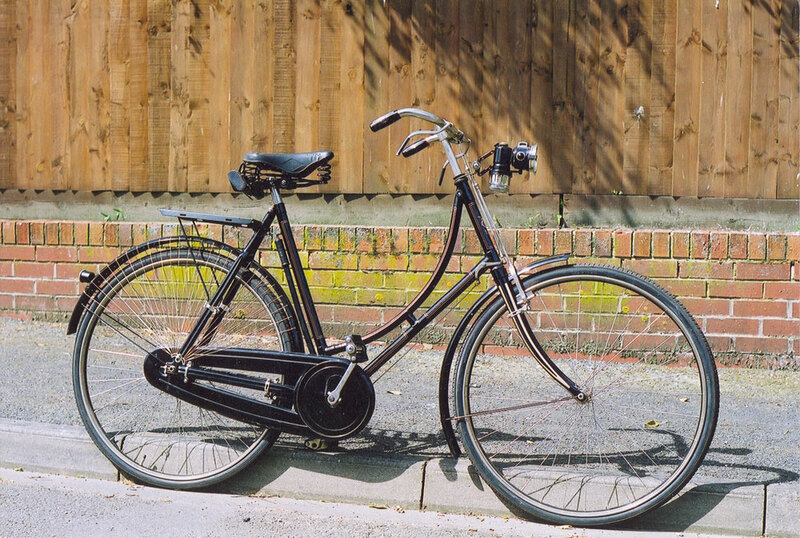 The steering lock is original. 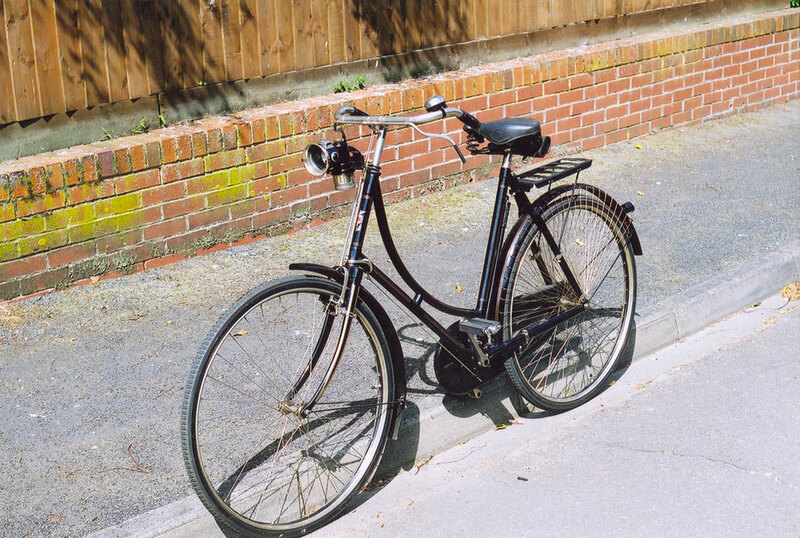 It was designed to prevent the front wheel wobbling and allowing the bike to fall over when parked against the kerb and also to make it difficult for someone to just get on and ride it away. Some had a knob like this example, others a bar and some a seperate key that could be taken away for security. 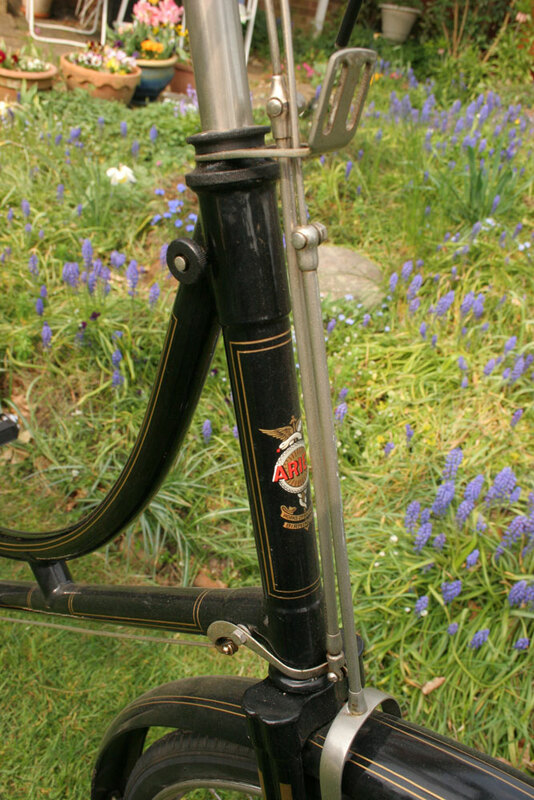 The picture of the rear stays shows the Biflex tubing, B-shaped in section, that was a feature of Ariel made cycles for many years. Note that the coachlines on the front forks are incorrect, they should be an outline only. 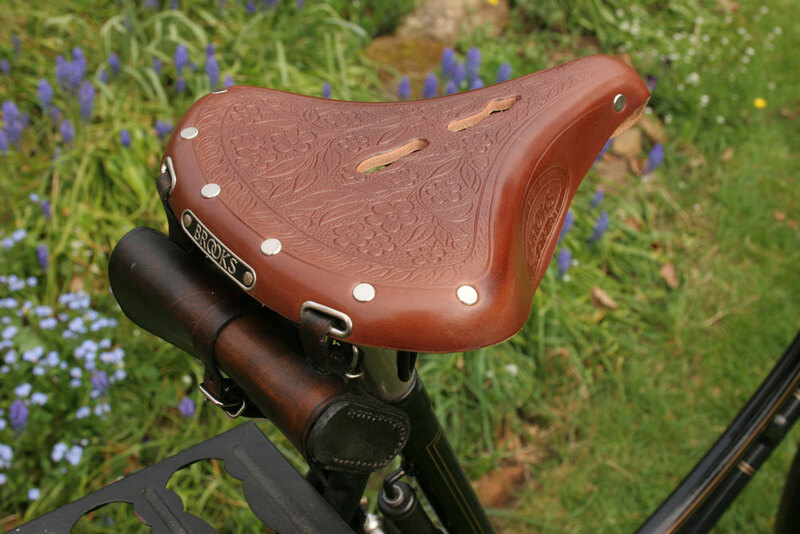 The new Brooks B18 Lady saddle is not the correct one for the cycle, but I have never found an original type that could be restored and I liked the look of the new B18. 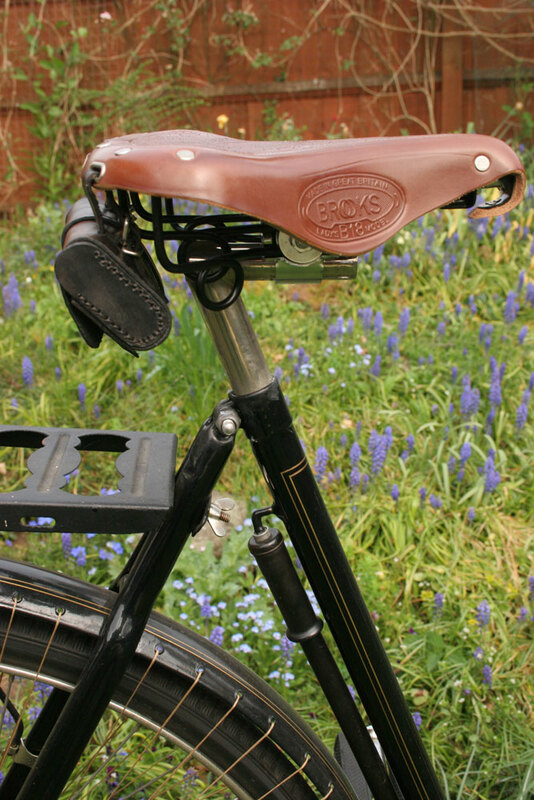 Saddle and basket were bought from the Old Bicycle Company. Transfers are available from The Ariel Owners Motor Cycle Club, please contact me. 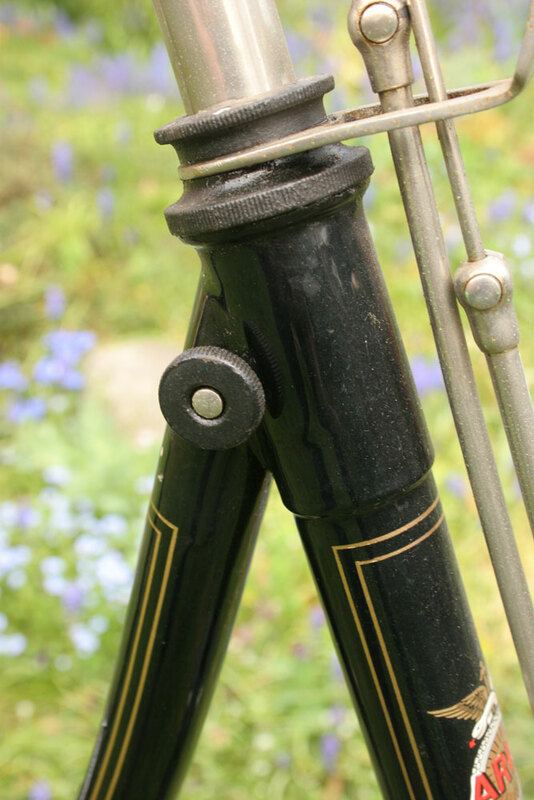 Rear stays showing biflex tubing, chain adjusters and dress guard fitting.